Auteur on Campus: Jack Arnold at Universal (48m 10s, HD) This is a wonderful documentary from the guys over at Ballyhoo Motion Pictures. They have given us some of the best film documentaries of the last ten years. They gave us Dues Ex Machina: The Philosophy of Donnie Darko from Arrow Video’s amazing Donnie Darko blu-ray and Who Goes There: In Search of The Thing and 1982: One Amazing Summer! from the awe-inspring John Carpenter’s The Thing blu-ray also from Arrow Video. 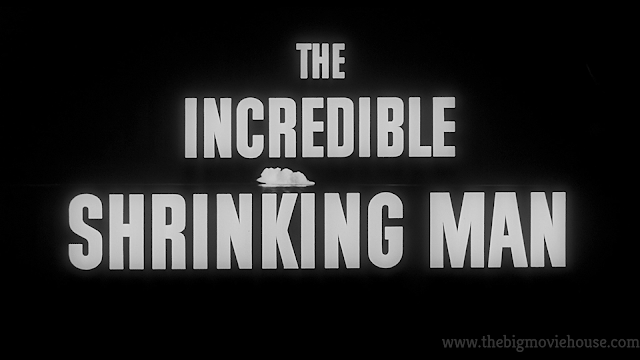 This doc looks at all of the films that Jack Arnold made for Universal while there during the 50’s. 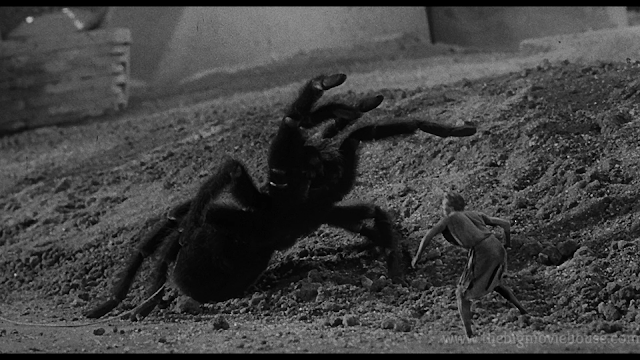 The classics like It Came from Outer Space, The Creature from the Black Lagoon, and The Incredible Shrinking Man are covered as well as The Glass Web, The Man from Bitter Ridge, and Red Sundown. I learned so much from this doc and hope that Ballyhoo have more to come. 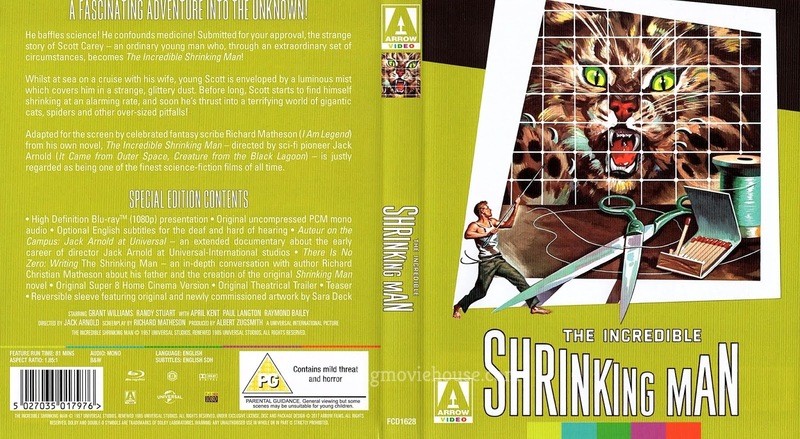 There Is No Zero: Writing the Shrinking Man (8m 33s, HD) This is an interview with Richard Christian Matheson, author Richard Matheson’s son. 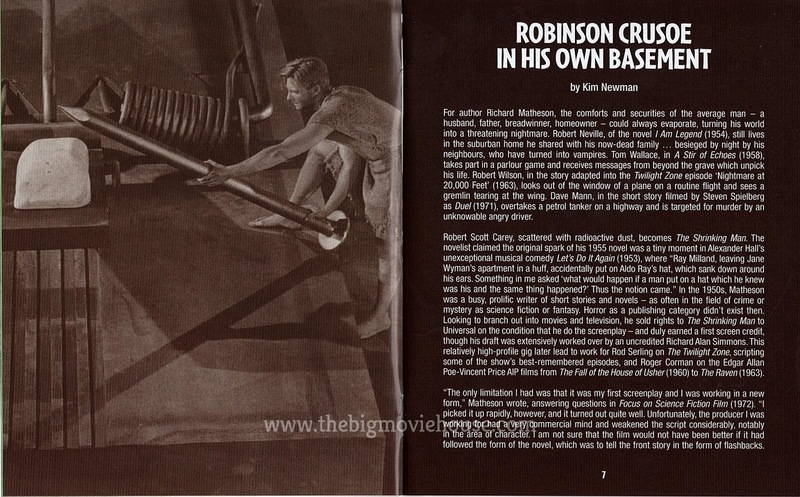 He talks about his father and the book the film is based on. He also talks about the differences between the book and the film. This interview was conducted by Ballyhoo Motion Pictures as well. Super 8 Version (8m 13s, HD) I think that we have always wanted to view films in our homes. Whether it be because we are lazy or because we want to be able to have the experience of watching a film whenever we want. Before we had VCRs and Laserdisc players, we had Super 8 versions of films.These versions, mostly done by Castle Films, would take the film from the theater and give us a “digest” or shorter version of the film. Think of it as cliff notes for films. The story would be condensed down to its barest form and then transferred to Super 8 film and sold to customers. Many of these versions of the films would be silent and subtitled, although there were some that had sound. 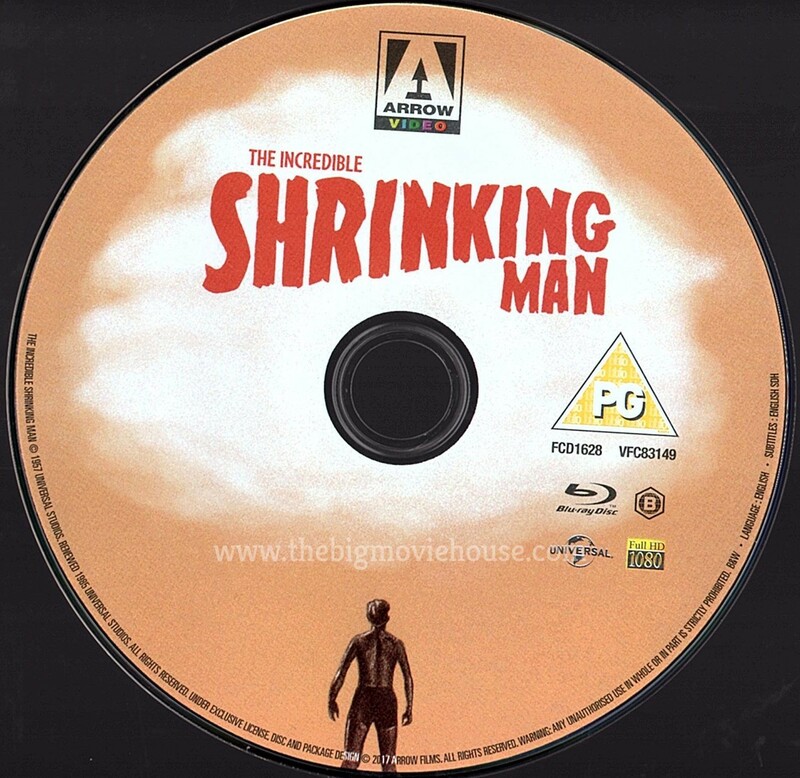 This is the Super 8 version of The Incredible Shrinking Man in all its tattered glory. The story is simple enough to shrink down (no pun intended). This is one of the Castle Films releases that contained no sound, but had English subtitles. The picture here is pretty rough, but the film is still watchable. This is nice to have as it is a piece of film history. Teaser (39s, SD, 1.33:1) Narrated by Orson Welles. This release is the Arrow Video U.K. release (no release planned in the U.S. as of this writing.). The default front art is commissioned artwork from artist Sara Deck and it is impressive, showcasing the battle between Williams and the spider. The reverse cover art features the film’s original theatrical poster that gives us a taste for what is to come. There is also a 24-page booklet with an essay from film critic Kim Newman as well as a small photo gallery. The booklet concludes with information about the transfer and the blu-ray credits. Universal provided the transfer that Arrow has used for this release and the results are positive. The look of the film overall is nice. Grain looks to be kept intact and this lends itself to some nice detail work throughout the picture. Contrast is great as well as the deepness of the blacks. 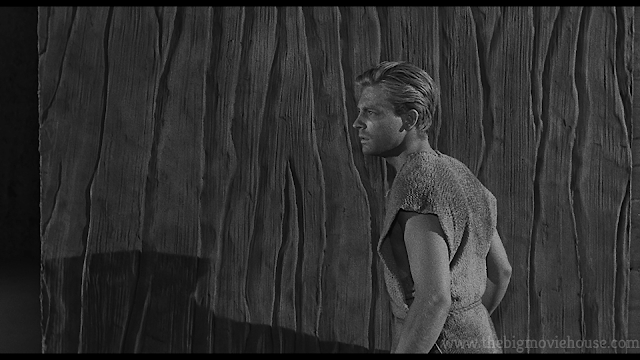 The uptick in resolution does make some of the effects, mostly the traveling matte shots, noticeable, but that is something that we have to deal with when it comes to films like this being shown in 1080 or higher. I do wish that Universal had let Arrow do their thing like they did with John Carpenter’s The Thing. 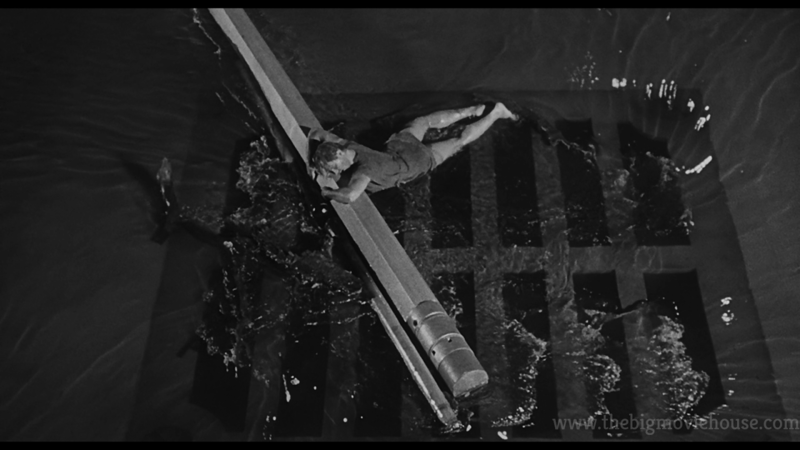 Arrow was able to make that film a standout in the picture department and I think that they would have done the same thing with Incredible Shrinking Man. This is a good transfer but one that misses the mark of greatness. The sound is nice as well. The LPCM track lends itself greatly to the score for the film. The score is the standout of the film, outside of the effects, and this track lets it sing. The Incredible Shrinking Man is a film that if the score were taken out, a lot of the effectiveness of the film would be lost. 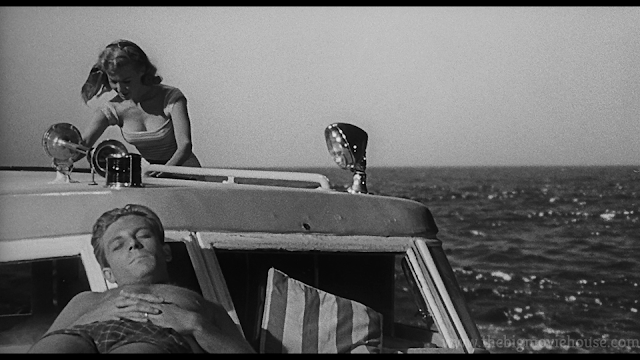 The score, like many during this time, elevates everything in the film, from the simplest of tasks to the biggest moments. Dialogue is crisp and clear as well with the narration being the best dialogue of the film. 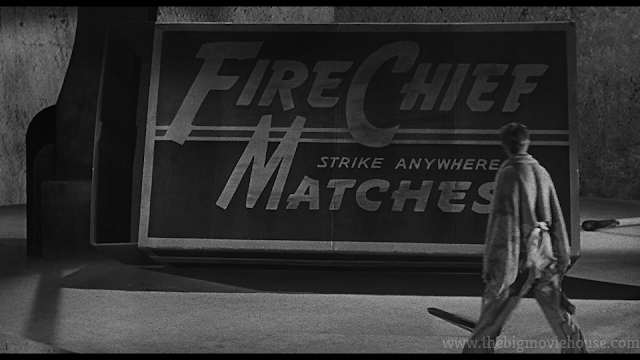 The 1950’s were a great time for science fiction films. 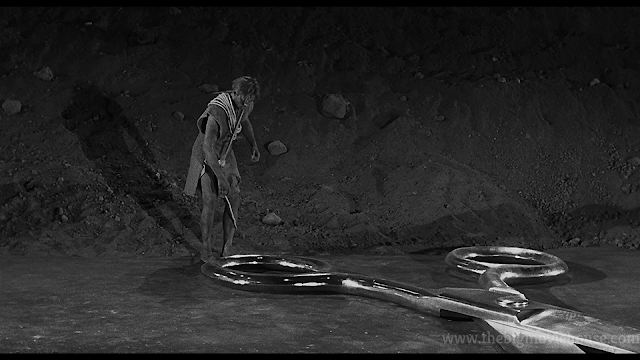 We had films like The Day the Earth Stood Still, The Thing from Another World, War of the Worlds, Invasion of the Body Snatchers, The Blob, 20 Million Miles to Earth, and The Quatermass Xperiment just to name a few. It was a time for sci-fi fans to rejoice and see things that they had never seen before. It was also a time to be scared. The Cold War was going strong and there was always a fear of nuclear war. Many of the sci-fi films that came out during this time were littered with allegories to war and nuclear fallout and Hollywood was leading the way. Invasion of the Body Snatchers was a film that drummed up fear out of the Red Scare and not knowing the person you thought you knew. All of the giant monster films, from Them! to Godzilla, were answers to the nuclear bombings done in Japan and testing done in the deserts of the U.S. In fact, many sci-fi films take place in the desert. Mainly for budgetary reasons, but also because that is where a lot of these giant bugs and animals would come from. 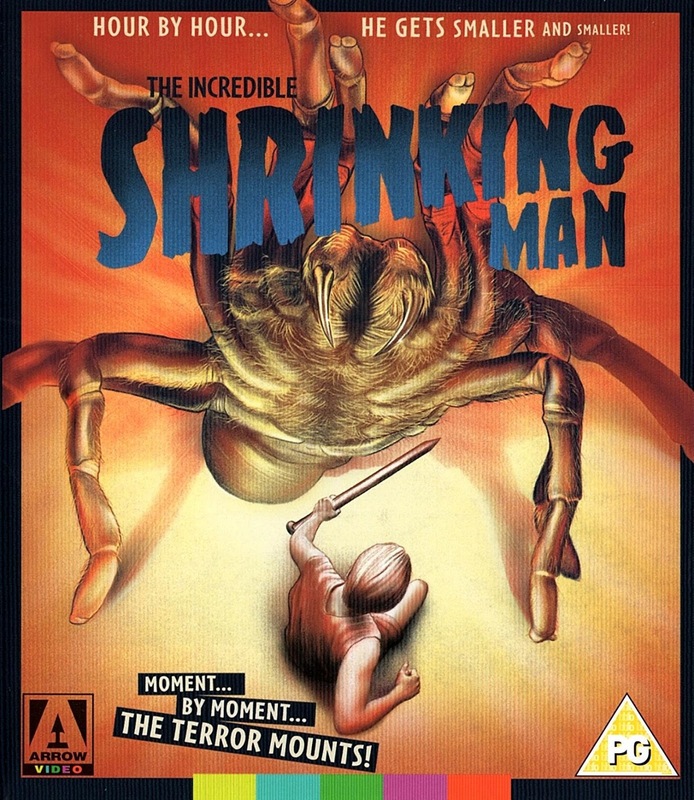 The Incredible Shrinking Man is not really a film about nuclear fallout or giant bugs and this made the film different from those film released around the same time. The film is more about what might happen to a person if they shrunk down to a size that would make them vulnerable to things that wouldn’t scare us any other time. The science in this science-fiction film is more believable than most of the sci-fi films of the 50’s and that is what scares us the most. The thought of shrinking such a small size is something that could scare most people. Sure, shrinking down that small could have its benefits, but we would have to deal with a whole new set of problems. 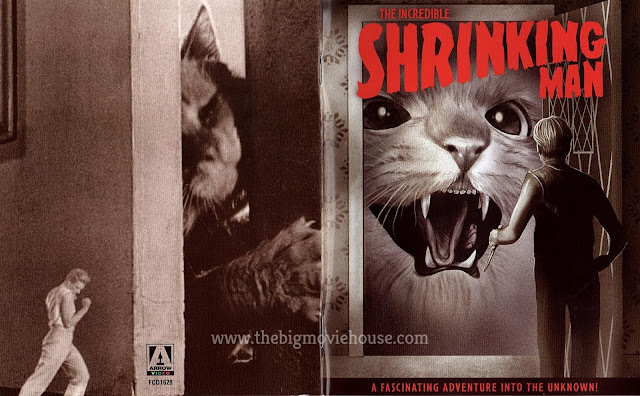 In the film, star Grant Williams has to deal with the family cat and a spider that has been living in the basement. 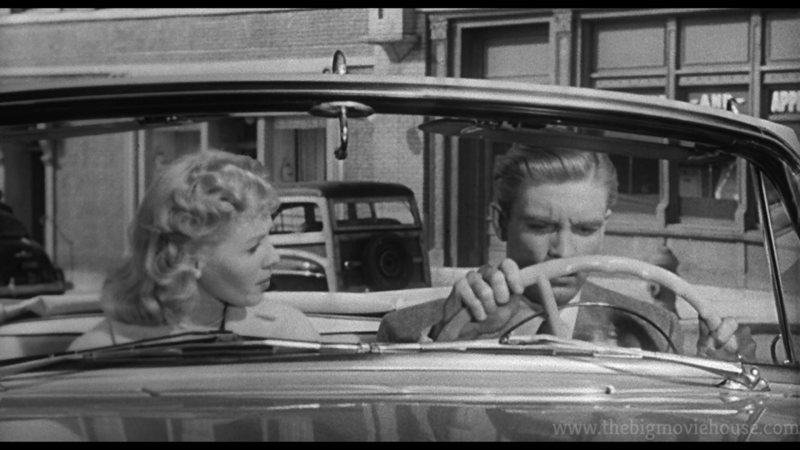 While the film isn’t all that scary to us now, it sure was in the 50’s. This is something that we had never seen before and we watched in wonder as Williams fends for his life against the aforementioned threats and trying to find food and water. Even the threats of a single raindrop is harrowing. All of this is done with complete seriousness. There is no winking to the camera. This is happening and it is scaring us as much as it is thrilling us. We are having fun watching the battle between Williams and the cat. We are intrigued with how Williams creates weapons out of normal household items, like a needle and thread, that are normal sized to us. 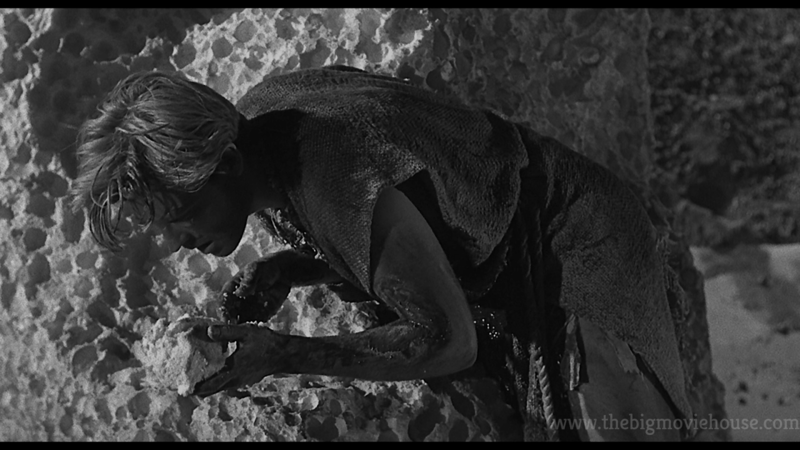 The fact that the film never jokes around with anything that happens in the film is a testament to the filmmakers. Today, we would get a film with a well-known comedian, probably Will Ferrell, and everything would be a joke. “Hey, look at this giant banana.” Or “I am fighting a giant cockroach! Isn’t this wacky?” The film would even try to take the subject matter seriously because everything is a joke nowadays. I think that is why I love films from back in the day. There was an innocence to them and everything was taken seriously. Sure, we would have films like Dr. Strangelove or Catch-22 where serious subject matter is still treated seriously, but with a satirical twist. 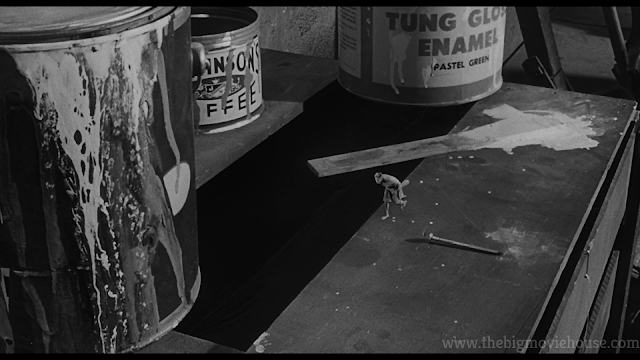 Still, we didn’t see Peter Sellers mocking for the camera or Slim Pickens turning to the camera as he rides the nuclear bomb down to its intended target, and saying “I hope my insurance covers this.” or something funny. Don’t get me wrong. I love films that poke fun at serious topics, but not all the time like we get now. 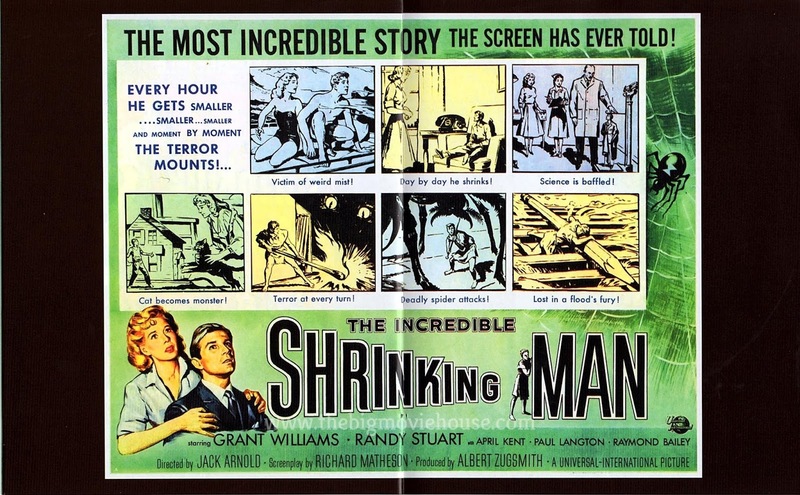 The Incredible Shrinking Man was directed by Jack Arnold. He gave us the 3-D sci-fi classic, It Came from Outer Space as well as giving us the last classic Universal monster in form of The Creature from the Black Lagoon. Arnold was the right choice for the film as he brought a sense of realism to the film that might not have existed under the eye of another director. 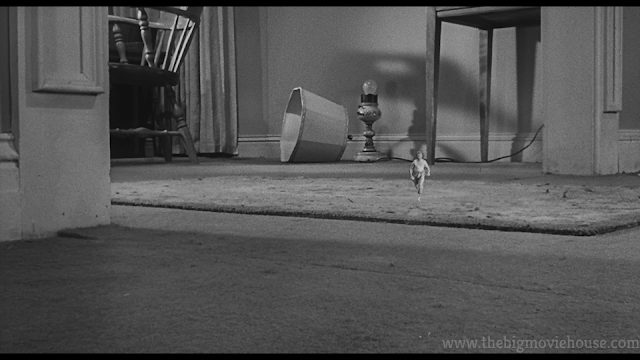 Arnold knew how to shoot effects and make them, for lack of a better word, effective. Never once during the film, even with the less than stellar matte shots, do we NOT believe this is happening. 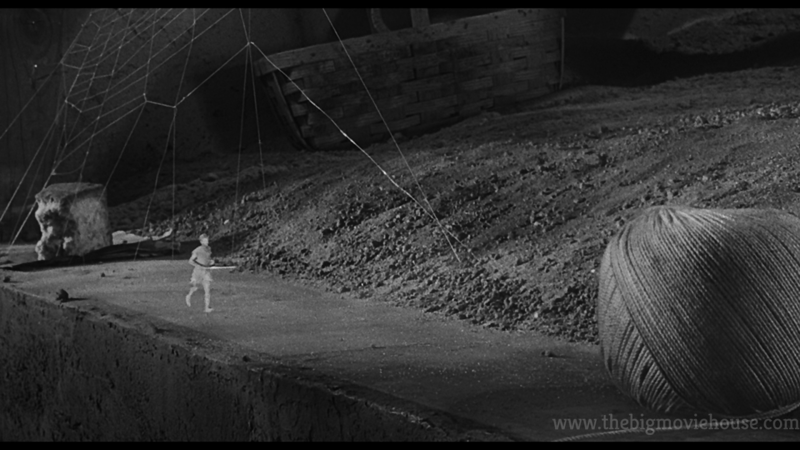 We believe the cat and the spider are threats and we believe that Williams is going to be killed by said spider. The Incredible Shrinking Man is a true classic. The film does everything right and is thrilling and exciting. I had a ball watching the film and getting wrapped up in its story for an hour and a half. The special effects hold up today and writing and direction are on point. I do wish that we would get another adaptation of this story today. The film could be great in the right hands and could be a thrilling and even maybe scarier than this version. The blu-ray, from Arrow Video, is great. The video and audio are nice, but could have better if Arrow was able to due a proper scan at 2K or even 4K. The special features, outside of the film itself, are the best thing on this disc. Ballyhoo doc about the Arnold years at Universal is just fantastic and their interview with Richard Matheson’s son opens the film up more. I also liked the inclusion of the Super 8 version of the film. This is a great disc that fans will love.